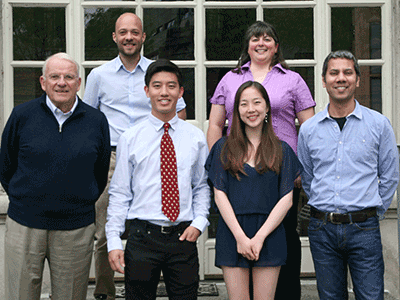 Two Neurobiology concentrators were awarded prizes for their theses this year. Vivian Hua (Dulac lab) received a Thomas Temple Hoopes Prize and Ned Lu (de Bivort lab) won the John E. Dowling Thesis Prize. The Thomas Temple Hoopes Prize, a Harvard College-wide honor, was established in 1982 to recognize outstanding undergraduate scholarship. In particular, the Hoopes Prize celebrates excellence in writing and presentation. Each winner receives a cash award of $4,000. Their faculty nominators receive an honorarium of $1,500. Neurobiology concentrator Vivian Hua earned a Hoopes prize for her submission entitled “Identification of the Releasing Stimuli of Pup-Directed Behaviors: Biochemical and Behavior Studies,” nominated by Professor Catherine Dulac. The 2016 Dowling Prize was awarded to Ned Lu for his thesis “Locomotor plasticity in Drosophila melanogaster: A role for proprioception in acute response to injury.” In his thesis, Ned examined the role of proprioception (that is, sensory feedback about limb position) in the recovery of locomotion after leg amputation. After an extensive and elegant analysis of walking direction, speed, and gait, Ned helped discover that proprioceptive deficient flies had less impairment in walking after injury, but also less recovery over time. Ned performed his thesis research in Professor Ben de Bivort’s laboratory at Harvard College.